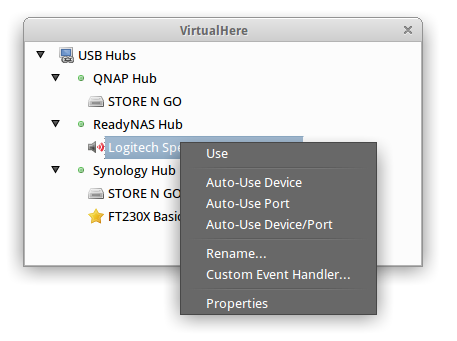 The VirtualHere USB Client runs on Windows, OSX and Linux. The client was created to be intuitive and extremely easy to use. 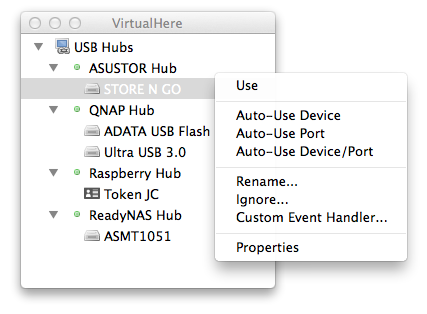 The client needs to be run on any machine that wants to use USB devices shared by the VirtualHere USB Server. 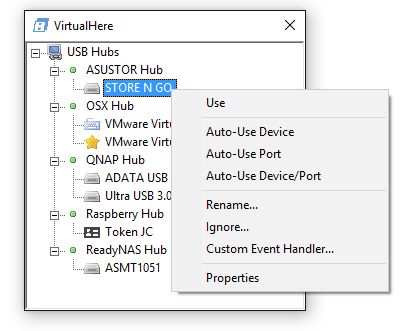 The software will automatically find USB devices shared by VirtualHere USB Servers on the network. Available USB devices will be displayed in a tree. Right click on the device you want to use and select Use. It will then appear to be directly connected to your machine and can be used just like a local device! Most linux versions have this compiled and enabled, if not see here.